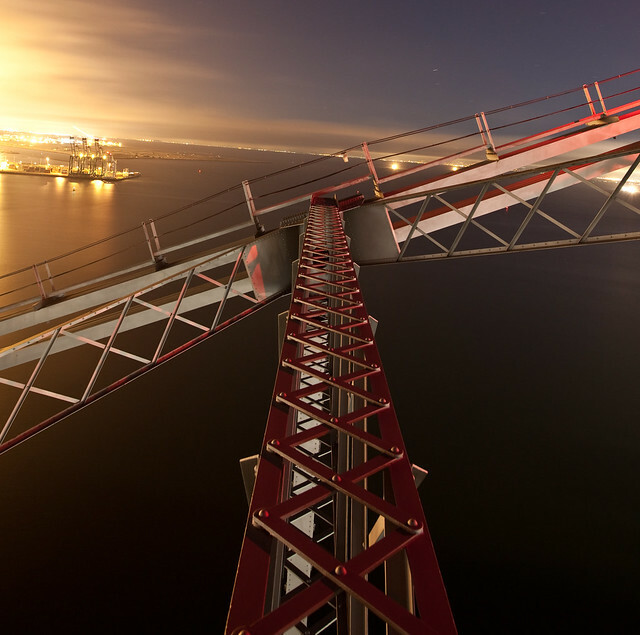 I was back from graduate school and sitting 389 feet above the San Francisco Bay, my feet dangling from historic, 1930s-era steel. I never saw myself a bridge climber, to be honest. Why infiltrate something that you can see every day through the comfort of your vehicle? But this bridge was different. Its destruction was imminent. 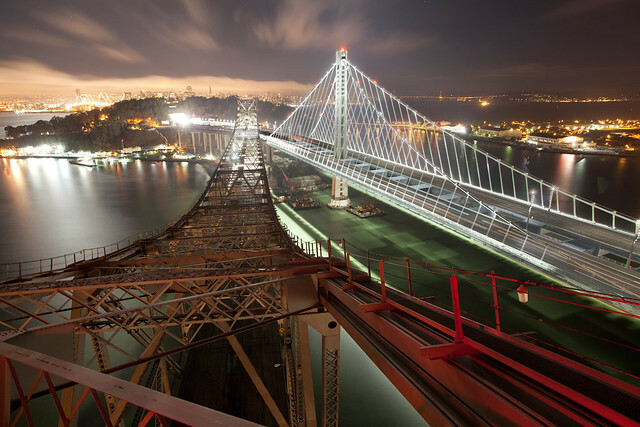 Nearby, the $6.5 billion eastern span gleamed in LED effulgence, its cables the bar-lines rising to a symphonic crescendo. As a musical score, the new eastern span seemed vaguely ceremonial, its own funeral march for the old, silver, earthquake-prone behemoth sitting next to it. If I’m being honest, I should also admit that I found the new bridge underwhelming given its price tag. Maybe it’ll save a lot of lives some day, but its design seemed to have little to do with the history or culture of the San Francisco Bay. The appearance of palm trees along its center divide, a quintessential Southern California symbol perhaps best reflected that. But I was ready to get back in the groove with old friends. 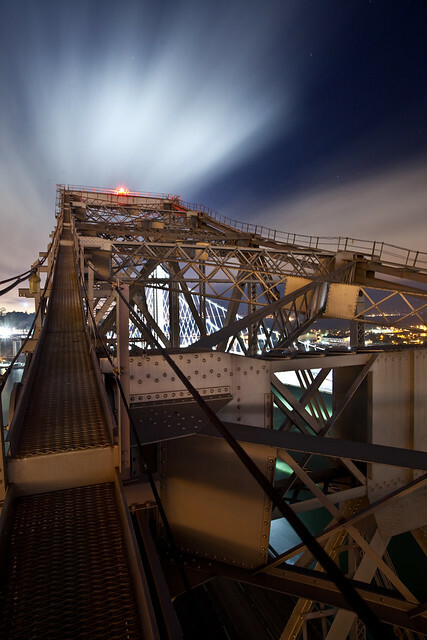 Stephen, who was a critical part of our Mothball Fleet team, was eager to photograph the span before it became inaccessible. The demolition contract was in the works and trucks began occupying the lower deck. Our window of opportunity was short. 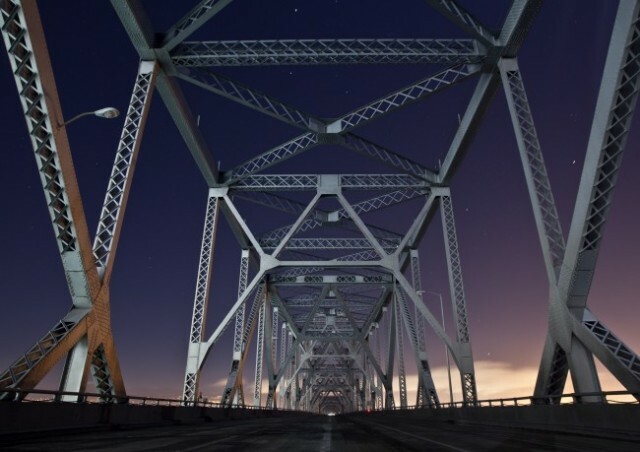 Because intrepid explorers before us tried – and failed – to visit the bridge without being caught, a highway patrol officer had positioned himself at the most convenient entrance. Despite these challenges, Stephen, D, and I decided to make a go for it on a clear winter evening. We parked a distance away and began our walk down towards the Art Deco pier dubbed “E1.” Plans call for the pier to remain as an observation deck for the new bridge. The gigantic concrete tower served as a tension tie-down for the cantilever truss. Basically, E1 is holding down – rather than supporting – the truss, which is designed to lift up on its ends. A glint of full moon arose from Oakland behind the massive Yerba Buena pier. 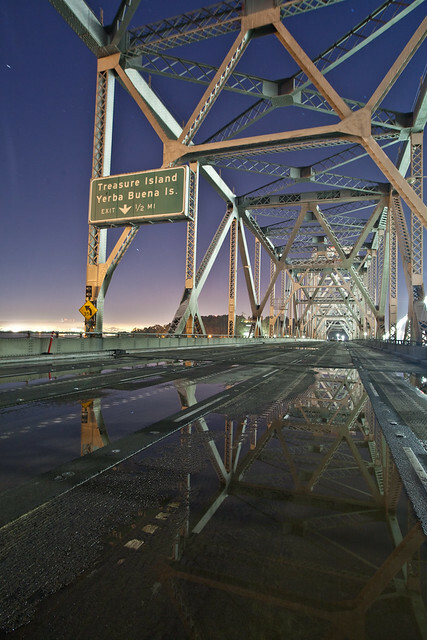 The East Bay crossing is often under-appreciated due to the more dramatic western span suspension portion. Nevertheless, it was a critical piece of what was – at the time – the largest bridge in the world. Only by looking at the bridge in the context of its Depression-era construction can one appreciate the elegant simplicity of its design. It has been heralded as a “marvel of utilitarian efficiency.” Even some of the cranes used in its construction were incorporated as part of the structure. 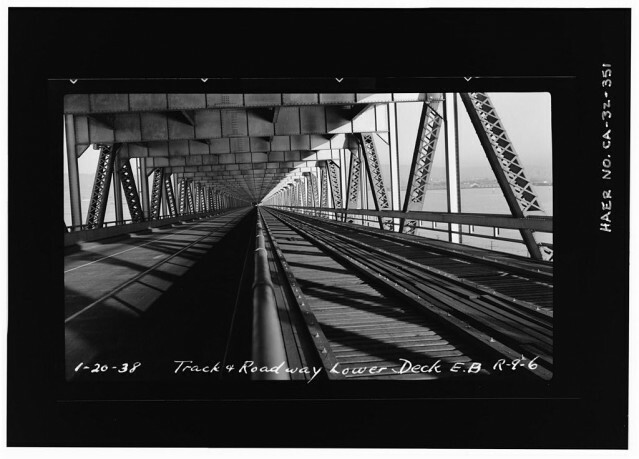 At a cost of $77,000,000 (for the whole bridge, including the eastern and western span), taxpayers in 1934 paid 1/100th what we’re saddled to pay for the eastern span, largely through toll fees. 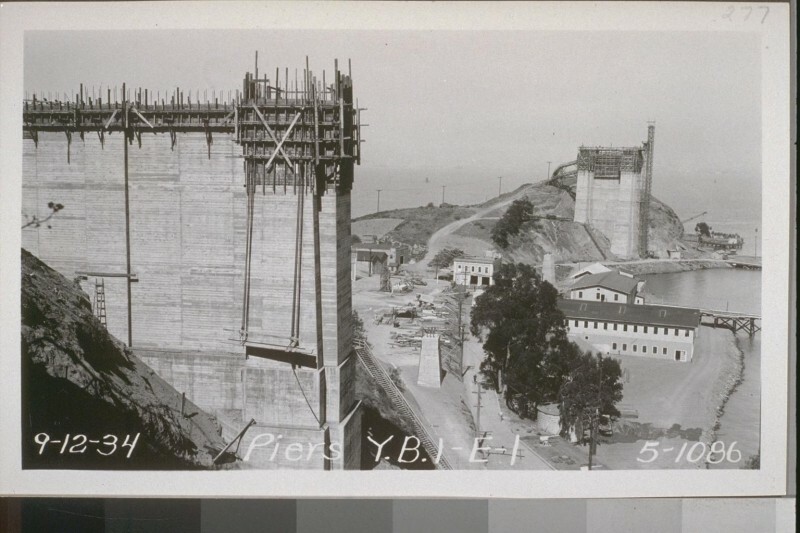 The East Bay crossing – now half demolished – is comprised of three different basic bridge types .First, closest to Yerba Buena is a series of two cantilever trusses, in the middle of which are 66 feet of pavement and steel. 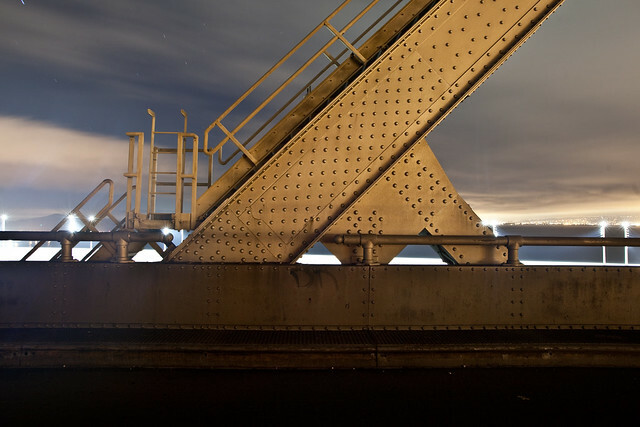 Between the cantilever trusses and the Oakland shore is a series of fourteen deck trusses.Finally, as the bridge makes its descent on to Oakland shore (from a maximum height of 389 feet above sea level), the bridge transitions to girder spans. 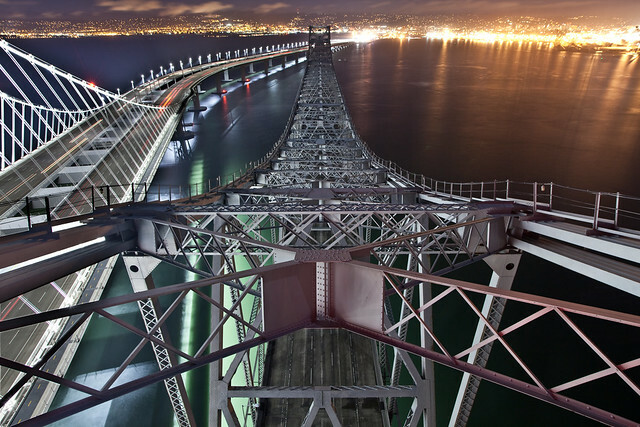 The true innovation at the Bay Bridge, however, remains invisible to all – that is, its massive caisson. The chamber was floated into the middle of the channel between Yerba Buena Island and Oakland, then sunk – 242 feet underwater. It remains to this day the world’s deepest bridge pier, and chances are it will remain there, forever, invisible to all. It was dark, and Stephen knew the best route – a testament to hours of scouting and preparation. We ambled through ivy and blackberry, passing by abandoned Coast Guard facilities along the way (one of which, what appeared to be a large barracks, is now demolished). At the angle of repose, we found ourselves tripping through dense brush and collapsing soil. Erosion netting was our best friend; the thick twine served as foothold as we passed under the new span to reach the footing of the old bridge. Twenty feet above was the lower deck, now devoid of life save for a lone highway patrol officer facing the oncoming traffic out of the Yerba Buena Tunnel. The immediate challenge involved shimmying up a three-foot gap between the concrete footing of the bridge and one of its steel support columns. The process was easier than it looked. Stephen and I slipped over the Jersey barrier and leaned low to avoid attracting attention. We paused to collect our gear and made a mad dash away with the patrol car to our backs – nothing to hide the officer from seeing us in his rear view mirror. We passed port-a-potties and piles of corrugated metal along the way. An army of cherry pickers, portable generators, and work lights lined the edge of what was – at one time – devoted to truck and train traffic (until 1958 when the lower deck was converted to general vehicular use). At the time, the lower deck was much too dark to photograph, besides the fact that we both felt exposed should anybody patrol. We knew that the upper deck offered a better long-range view of any incoming security, so we opted to climb one of the few maintenance stairs up to the second level. Eerie silence. That’s how I would describe the feeling upon emerging on the empty upper deck. It was like emerging from a cocoon. The darkness of the lower deck gave way to bright steel, engineering on display, beauty in design. Fifteen years of driving this deck, and I never imagined walking it alone, at night, devoid of traffic. 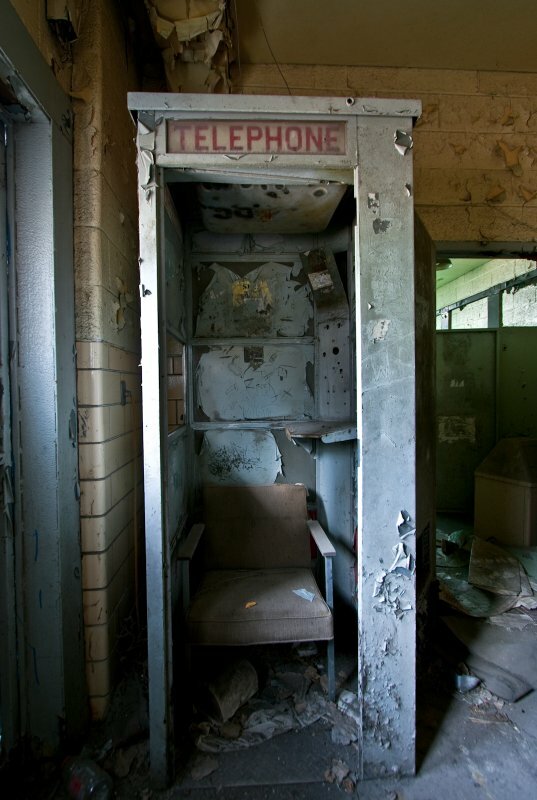 There it was – the ‘utilitarian efficiency’ waiting to touch and examine, climb and muse over. Rivets followed patterns. Steel had logic. The only thing random in the experience were the scars of 80 years – places where the rubber of tires screeched along the bare asphalt; sites where accidents occurred, where wayward trucks managed to hit the tons of steel only to make negligible dents in its superstructure. Peering from the upper deck, straight down, was an exhilarating experience. The water took on a radioactive green appearance due to the LED lights projecting from the new span to the north. Like our adventure in Vandenberg, I knew that the side of the bridge would be our only refuge – should a security car approach. There was nothing else to hide behind at that point. I mentioned the possibility to Stephen. Bailing over the edge of the bridge would offer protection from being seen, but we would be entirely subject to our own judgement and footing. Other than steel girders about a foot across, there was nothing to stop our fall 200 feet to the water. The two of us dropped our gear behind a portable generator light and took swigs of water. As I was sipping, off in the distance, I saw a lone truck approaching us – on the same deck we were on. “Stephen! Somebody’s coming.” We both looked off in disbelief; we expected the lower deck to be patrolled, but not the upper. We had little time to contemplate what to do. The truck would be in our sight within 30 seconds. All we could do was bail over the side. I chose a diagonal column – a thick, steel I-beam that allowed me to lay at an angle. Stephen chose a vertical column – gripping on to the sides of the I-beam with all of his strength so as not to fall in the water below. In the rush to hide we left our gear behind the portable generator. My camera was standing upright on a tripod. Should security recognize our gear, we would be had. The truck pulled up to the generator light and slowed to a stop. We anxiously anticipated the “Hey! Who’s here?” yell. The man fired up the generator and the upper deck was blanketed in new light. The truck resumed across the bridge to the next light, about 200 yards down. We hopped back on to the deck and contemplated leaving. We agreed to at least to take a few images first. Besides, an exit would be risky, should the truck make a round trip and return. The most prudent option, it seemed, was to climb the cantilever and take images from the top while waiting for the truck to finish its rounds. Stephen got a call from D, who was supposed to join us later in the evening. “The Highway Patrolman has moved further back. I can’t make it in without being seen.” D would later return with Scott, Stephen, and myself for a final hurrah. But that would have to wait until later – just weeks before the cantilever was unceremoniously cut in half and the dismantled steel transported to the nearest scrapyard. Then we climbed. Eventually, we found ourselves at the crest of the bridge, 389 feet above the Bay, contemplating all we had accomplished in the past hour. Stephen and I munched on granola, staring out on to the moonlit estuary in the distance. Barges filled with the scrap and detritus of construction stood in the distance. Beyond, the $6.5 million Treasure Island proclaimed the uniquely Bay Area gumption to do things that seem impossible – building islands, pyramids, underwater transit tubes, and bridges to set world records. Tonight I saw a video which reminded me of a moment eight years ago. I saw an officer of the UCPD, an officer at the alma mater for which I have always held high respect, senselessly beat a nonviolent woman standing her ground. The part that truly discourages me, however, is that I know the UCPD from personal experience, and that wasn’t the first time they resorted to such heavy-handed tactics. I was once part of the UCPD’s lowly student ranks of Community Service Officers; we earned a measly-but-much-appreciated $11 an hour as we paid our way through college. My job there was a much-needed source of funding for education. Despite my love for UC Berkeley and all it has given me in life, I can’t help but be critical of its police department. It’s a department which, I know from personal experience, DOES NOT respect free speech, despite being located at the hearth and birthplace of free speech in America. The beginning of this story goes back seven years: In 2003, innocent civilians were being firebombed in Baghdad by U.S. jets. 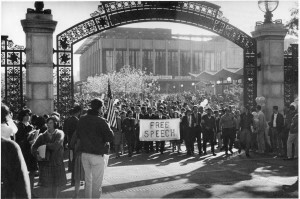 The New York Times called such bombing “brilliant,” but I was among a small group of students at Berkeley who considered it nothing of the sort. It was unjust, terrorizing, wrong (not ‘brilliant’!) And we occupied the administration building in recognition of our heartfelt celebration of the free speech for which Berkeley is known. From the beginning, we were presented as the ‘radicals’, the ‘liberals.’ How radical is it to voice a reasonable opinion against senseless destruction and violence? Does “shock and awe” only belong to the saber-rattling jingoists? Many of us weren’t even liberals; we were libertarians, social liberals – maybe – but nothing of the drug-imbibing, commune-championing, hemp-loving, redistribution-believing hippies that Fox News would like you to think. We simply believed that Iraqi civilians didn’t have to die (115,000 and counting to this day). 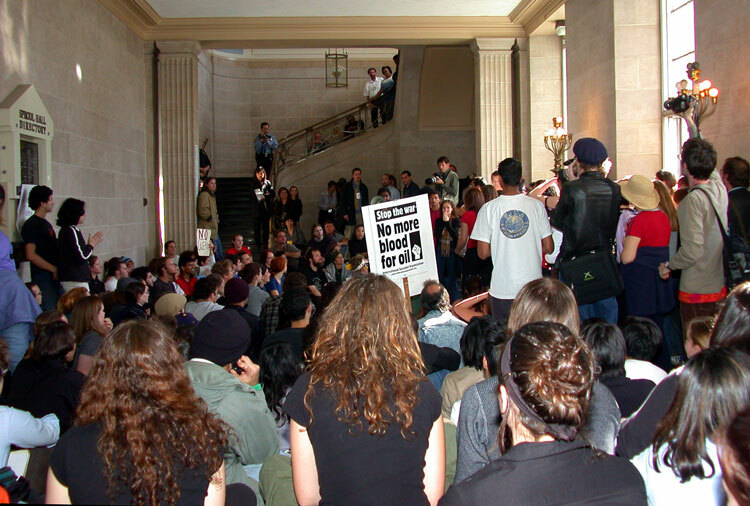 Sproul Hall on March 20, 2003. I was sitting to the left of the man in the green jacket. So we stayed nonviolent. The police put “pain holds” on many of us. We were dragged and carried away by two to three police at a time. One-hundred and nineteen of us were arrested that day. I felt good to be an American. But the unfortunate part is that it would be the first and last time I would put my future on the line for a political belief, for I now know that our constitutional right to free speech is not being protected as it should – and lifelong consequences can come of it..
A few days later, I was called by administrators at the police department. I was to lose my job. Later, charges of trespassing (602L) were dropped, but that didn’t matter to the upper tiers of the UCPD. The Chief of Police, the lieutenants, and the captains in the department believed me to be another “liberal.” I had to go. I came in, gave my keys to the Lieutenant Mitchell Celaya, and said goodbye to my job. Later, Chief Victoria Harrison apologized for the whole ordeal, admitting that there were many former military veterans in the department who didn’t like what I did. The damage was done. I lost my job for a political opinion, and I felt less proud to be an American the day that happened. 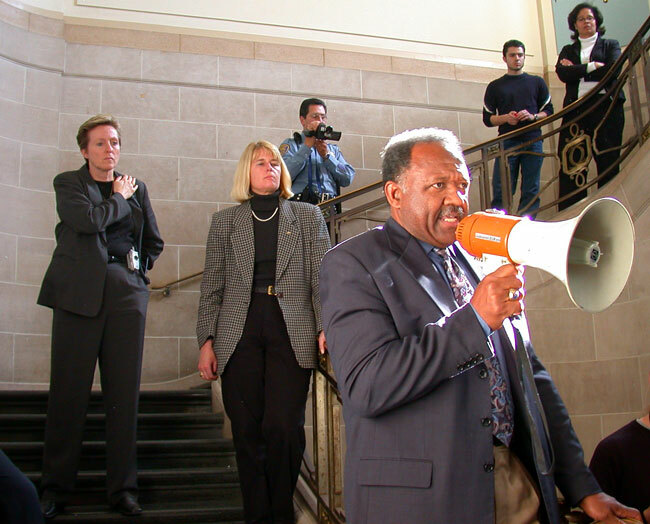 Vice Chancellor telling us we had to leave or be arrested - March 20, 2003, while bombs were being dropped on Baghdad. Flash forward seven years and I encounter the video. I recognize some of the silhouettes of the men. I’m sure some of the men swinging billy clubs are the same men who put the pain holds on me that day in March of 2003, the same men who worked with me before I lost my job. 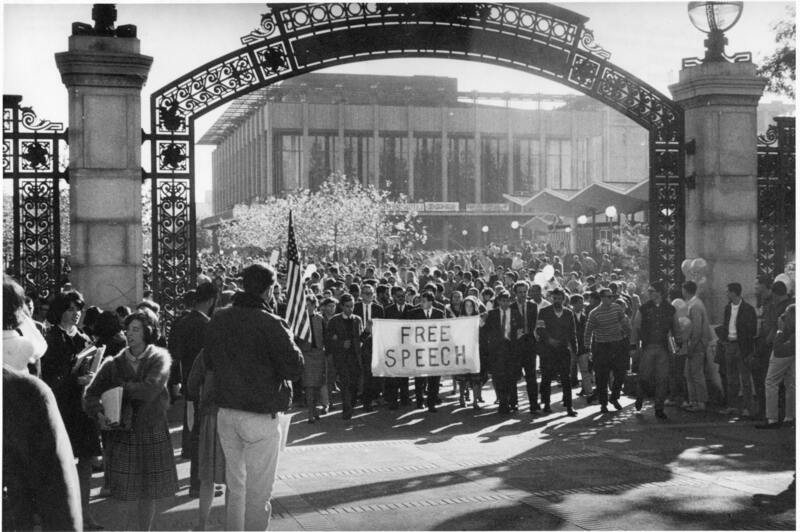 It’s amazing how little free speech is supported in this country today, some would say even less than it was in 2003. These bottom-up movements across the world, to me, are an effort to regain voice. For much too long, the average voter has felt as if her vote doesn’t matter. Our representatives answer to the “other” public – the 1%. It’s about time that our representatives in congress represent; otherwise, it’s about time that they lose their job too. Detroit is probably best known for its cars. By many accounts, the first mile of concrete-paved highway was Motown’s Woodward Avenue. But all too often, the city is judged by its end products. Detroit is really best understood through the raw materials it relies upon: the rubber, chrome, concrete, glass, coke – its steel. The seven towers of Ford’s Renaissance Center and the smokestacks of River Rouge are still proud citadels of manufacturing. 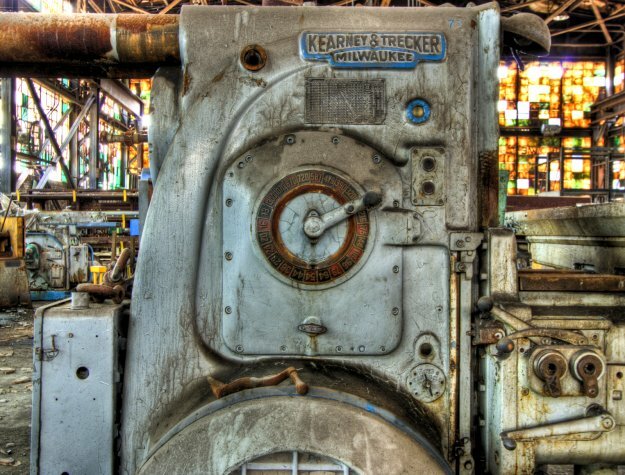 But step away from the modern-day hearths of production; curve south from the Detroit River along the Fisher Highway for about five miles and you’ll find the home of the cyclopean, abandoned hulk of McLouth Steel’s Trenton plant. This is where my story begins. 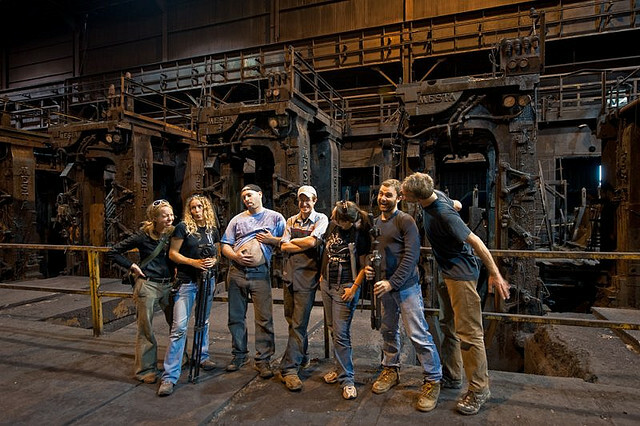 In the summer of 2009, six of us journeyed from Chicago, Illinois to Detroit, Michigan in search of the industrial patrimony of our country. Our motley crew was a cross-section of post-industrial America – we had a Texan turned Berkeley PhD; a web developer for a government agency; a renewable energy contractor; and a hedge fund operative. But for the week that we were together, we were all part of a collective organism testing our legal and physical limits to document what is left of our productive past. We spent five days maneuvering the bricolage of manufacture in decline. Massive mountains of solid sulfur loomed along the outskirts of Chicago. On the road to Detroit we descried the melancholic remnants of proud rail stations, civic buildings, and hotels. 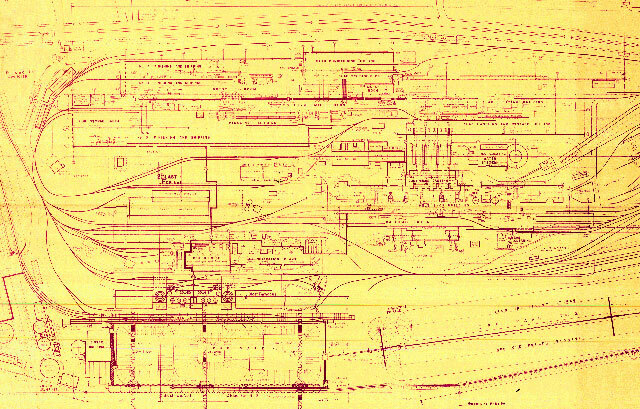 In the two months that preceded our trip, we’d amassed a cornucopia of 200 abandoned locations, and highlighted in red was our “must-see” – McLouth’s Trenton plant. We were lucky enough to procure temporary lodging at urban explorer extraordinaire John Law and Julia Solis’s home in Detroit, which they bought in 2008 for the price of a Cadillac Escalade. A short distance away was the abandoned ten-story Boblo Island terminal. Across the horizon was the infamous Michigan Central Station. Surrounding the house were houseboats and pleasure craft rotting in the canals that lined the periodically vacant streets of Dearborn. Our van bounced along the potholed roads as we joked about how long we’d survive the tough streets of Detroit. Gruff-looking Stephen Freskos, fellow traveler, was probably the main reason why we weren’t waylaid by 21st century, Motown pirates. But the truth is that our experience at Detroit was far different from our expectations. In many cases, Detroiters more than happy to provide detailed entry instructions on how to get into abandoned buildings; in other cases, they cheered us on (at one point, I was called ‘Spiderman’ while I traipsed up an 8-story building downtown). Despite the wild success of our first few days, we surveyed Trenton’s McLouth Steel plant with circumspect suspicion. Its fences were not kicked over or cut open and the fresh tracks of security vehicles were easily visible along the length of the 3/4-mile long factory. Still, it was a jewel. There was no getting around it. We had to do it. 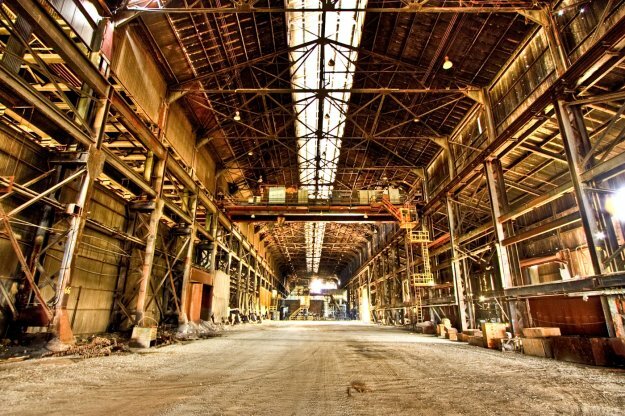 McLouth Steel was once America’s 11th largest producer of steel, yet it only accounted for about 1 to 2 percent of the domestic market at its height. 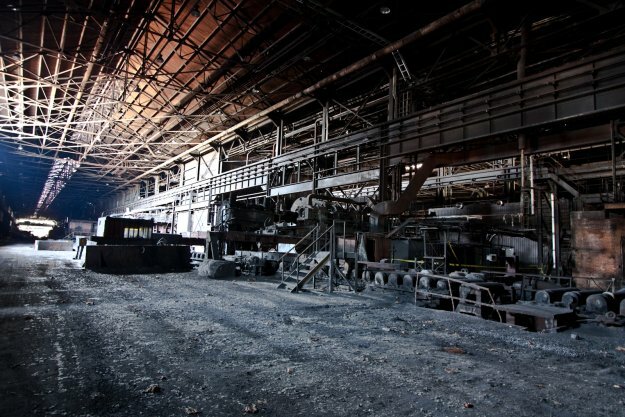 Its importance to the industry lies in its innovations: In 1962, McLouth was the first steel plant to use computer controls; it was the first North American plant to use the basic oxygen process; most significantly, it was the first steel mill to produce a completely finished product using continuous casting. So, with brazen braggadocio, our driver pulled to the side of the road near the plant’s slab reheat furnace. We promptly piled out of the car and under a gap in the fence. Within 45 seconds, a jeep sped up and screeched to a halt. A tall, thin man in his 20s hopped out of the car. So there we were, stuttering in surprise, unable to comprehend how we went from being trespassers one second to bonafide steel plant tourists another. We accepted his offer and parked our car near the guard shack. 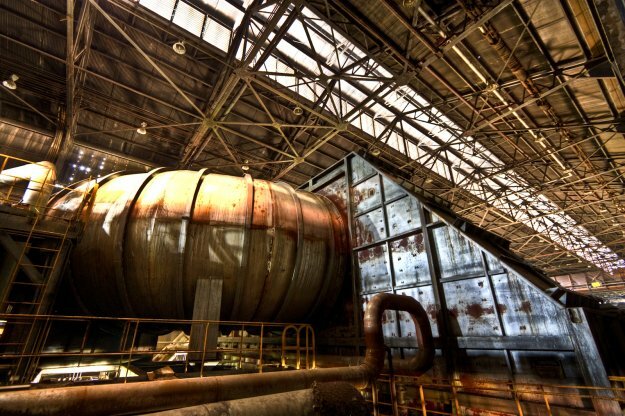 We dubbed him, “Steel Mill Steve,” and other than serving as the 900-acre plot’s lone security detail he was moonlighting as an urban explorer. 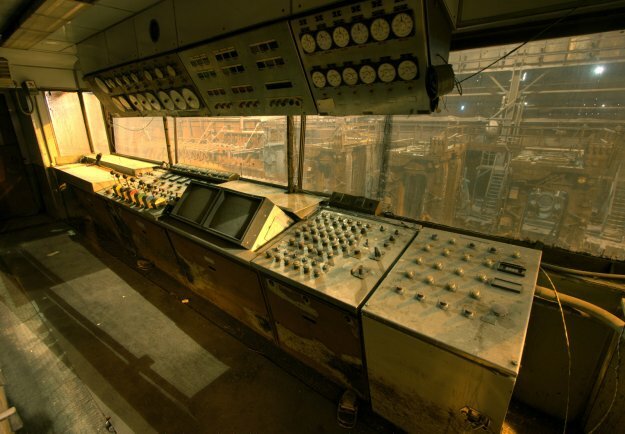 Steve utilized his access to fully document the grounds of the plant, record its history, and collect documents and maps before the plant’s inevitable demolition. Steel Mill Steve knew every minute detail of the plant and its functions; rarely do explorers have an opportunity to see such a place, let alone receive a full tutorial of its processes, functions, and layout. The apogee of McLouth can probably be pinpointed to May 9-11, 1972, when the largest continuous cast slab of steel exited the production line of the Trenton plant – The slab measured 44” wide and 9,972 feet long. Derived from a record 75 ladles, it weighed 8,500 tons. But from there, McLouth’s downfall happened quickly – ironically because of the efficiencies that the plant helped herald. Cheap steel from Asia, along with the adoption of computer-controlled steelmaking in other countries and the intransigence of union leaders were part of the reason; the oft-cited decline of the American auto industry in place of Japanese imports also played a role. In 1977, McLouth lost about half of its revenue when General Motors cut its usual order of steel. Unfortunately, American automakers were increasingly using plastics and decentralizing their supply chain. Between 1980 and 1981 McLouth bled to the tune of $100 million. It didn’t help that steel executives were reportedly spending precious cash to feed the deer at their upstate retreat. Four hours after introducing ourselves to Steel Mill Steve our time was up. The sun’s corona was barely visible over the low-rise buildings of Trenton, and a chilly breeze descended on the cold steel that surrounded us. 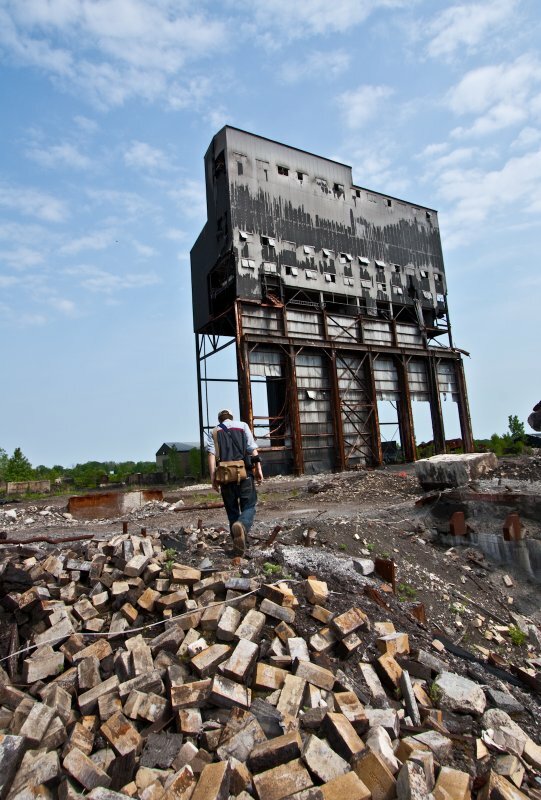 Steve took us for a final walk out to the demolished portion of the steel plant – negotiating cement and rebar rubble on his way to a tower in the distance. I snapped a final photo of him from a lower vantage point. Steve looks like the lone survivor of apocalypse – he could have easily been in Nagasaki in 1945, or looking at the decaying remnants of Chernobyl’s disused high-rises. The sun dipped below the horizon and we said goodbye to Steve. We’d just explored what would probably be our largest factory we would see in our lives, though much of what we saw then is now gone.